The T Register Annual Awards were announced at the gala dinner on the Autumn Tour and here are the worthy winners. 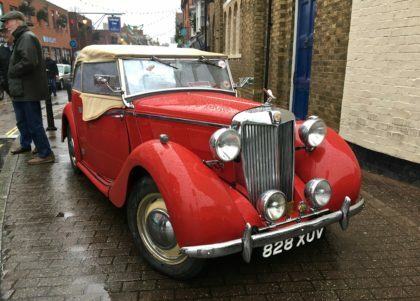 Awarded this year for a restoration. 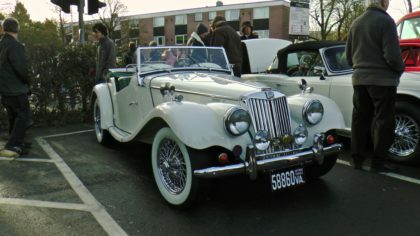 Given to David and Pauline Reeves for their immaculately restored TC which was on the Autumn Tour. 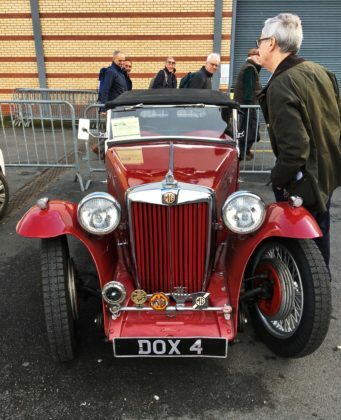 Awarded for ‘exploits in a T Type’. 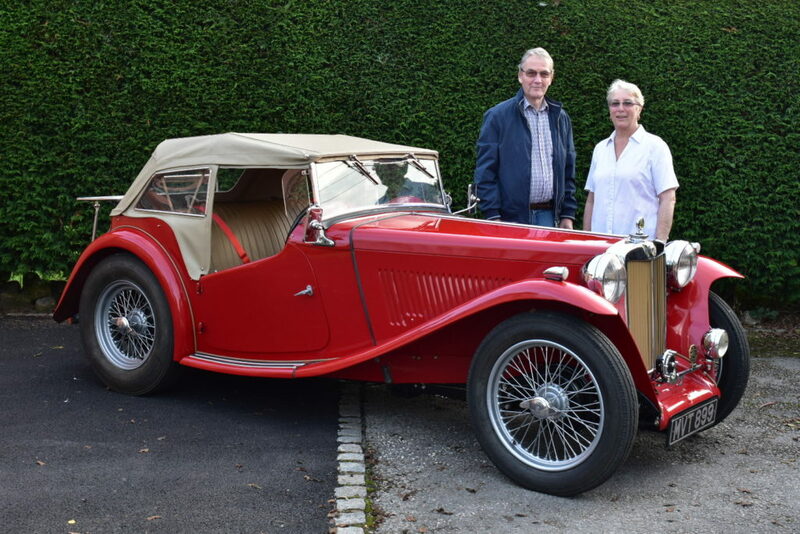 Given to Peter and Mandy Sprot for their trip to Malta and back, which started with attending the May trip to the Ardennes! Peter and Mandy also attracted a lot of attention in the TC in Malta resulting in an article in the Times of Malta. This is awarded ‘entirely at the secretary’s discretion’. Our Secretary has decided on previous recipients for all sorts of reasons, and often for something that they did which went beyond what’s expected of them. 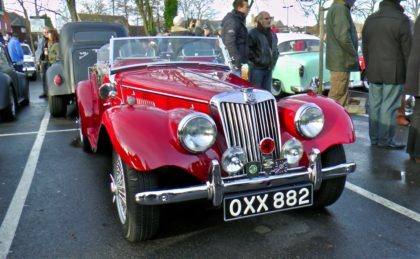 This year she decided to give it to Tony and Dawn Selman, saying to them, ‘I was very impressed by the fact that you set out to come to the Ardennes with a fairly new (to you) car, having not driven much more than an hour or two from home in a single trip beforehand.’ Tony and Dawn weren’t on the Autumn tour, but they have been e-mailed to let them know they’ve won it, and the award will be presented to them in due course. Let’s have September in Italy we said, we have the Motorhome and the time. Ah, but if we do, we’ll miss the T Register Autumn Tour, and that’s no good we said, so off we went to Shap instead! 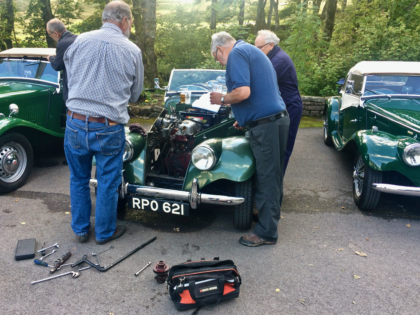 We took the motorhome with the TF trailered behind and were met by the Humphreys the great organisers at the Shap Wells Hotel along over 30 crews in T Types, an Aussie in a Y Type and a couple of moderns. The Saturday run was through the Yorkshire Dales. The route was great and the stops were both at castles. We had tea and cakes, photos were taken, the weather was favourable and smiles were wide. 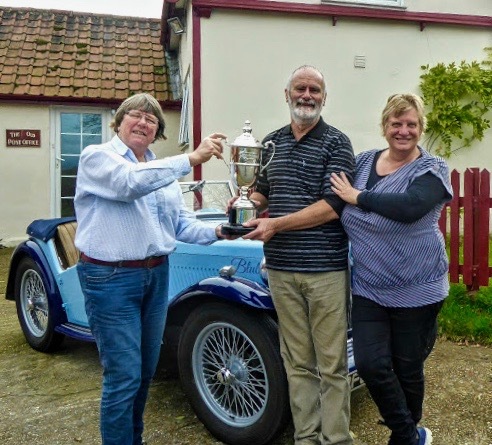 At the Gala dinner on the Saturday we were pleased to hear of those who had been awarded the prestigious trophies. Always willing helpers if things go wrong – even if they still need beer! 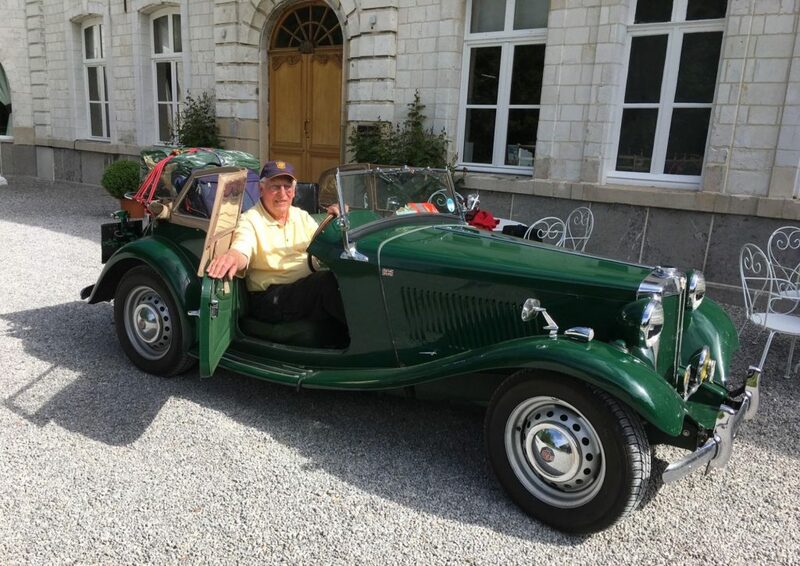 Mike Lugg our President regaled us with his famed poetry and the story of a banjo bolt (more on this in the T Register trip report to Ardennes in May below!). The Sunday run was through the Lakes. Our first stop was the Lakeland Motor Museum, where the hoods went up; but it’s a worthy visit with an array of motoring history. Then onward through the Lakeland towns to Grasmere. Many stopped for lunch and then the route was up the Struggle through Kirkstone Pass – a 1 in 4 but a mere nothing for a TF and a clear run up! Then onwards via Patterdale and a gentle return to Shap. A final dinner and sad farewells, hopefully we will see you all in Flanders in the Spring. Many thanks to Grant and Barbara Humphreys for all the excellent organisation. 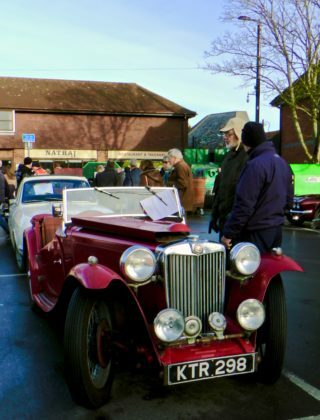 There is a album of photos and more pictures and two videos courtesy of Su Seaward on the T Register’s Facebook Page. 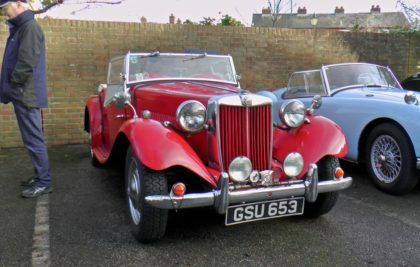 Well, the T Register T Party sort of became the MG Car Club T Party as our intrepid organiser Alan Wakefield did some of the organising for Chateau Impney for them! 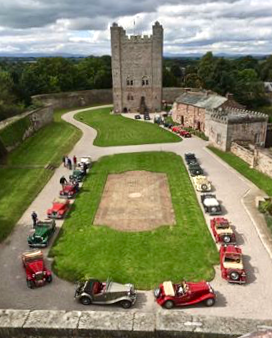 So we had quite a number of T Types plus various MGAs, MGBs, Midgets, V8/RV8s, all in our own Classic Car parking area, which Alan managed to arrange right at the front with a good view of part of the hill climb action. The hill climb itself was a great hit with the XPAG Specials drivers, and with James Thacker who used to race T Types but now races Alec Poole’s very fast Midget. 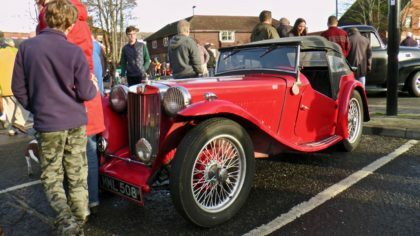 James describes the Chateau Impney Hill Climb as a bit like a garden party with an historic car event thrown in, with a large selection of cars from Edwardian through to VSCC and later racing and classic cars. The event proved to be very social and low key with more time for meeting people and looking around the paddock than at other events. 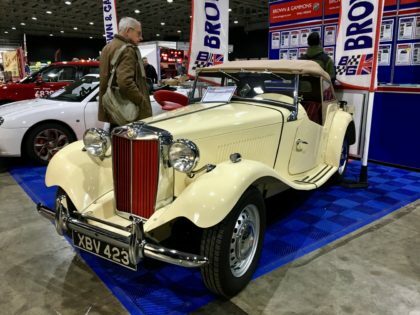 This was the first time that three XPAG Specials had been entered, the cars being Jack Taylor’s Lotus 6, Chris Pamplin’s Dargue MG and my own Lester MG. 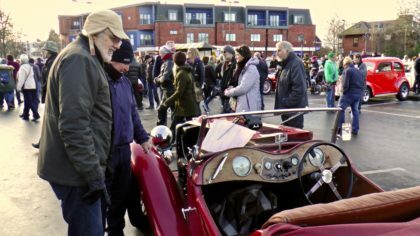 It was an excellent event, and the entry was the most varied I’ve ever seen, ranging from Edwardian racing cars to single- seaters, with everything in between, including eight ERAs and us! A dragster even made it up the hill during the lunchtime demonstration runs. The course itself was at first sight somewhat daunting; very twisty and narrow after the initial straight, and with a blind entry to a roundabout which needed a split-second decision as to which exit to take… There was then a ridiculously tight chicane, followed by a glorious sequence of bends to the finish. There was much debate amongst us Specials drivers after the practice runs as to which gears to use and when – Jack left it in second all the way up, whilst Chris and I took third along the start straight and past the Chateau. For the first timed run I left it in second, which meant just under a minute screaming along at 6000 revs plus. For the final run I decided to change up to third past the Chateau, but missed it and arrived at the roundabout in neutral, which concentrates the mind a bit. Chris went missing before his first timed run, having knocked his silencer off going over the ramp onto the aluminium track round the trees before the start line. The start line marshal kindly let him run out of sequence, with the comment that even without a silencer his car was quieter than some of the others! And we had all been noise tested, too. You can see all the photographs of the event on our Facebook Page. Many thanks to all who contributed photographs – Joy Batchelor, Mark Blomfield, Don Cameron, Stewart Penfound, Su Seaview, Bill Silcock, Sally Silcock, and my apologies if I have missed someone. 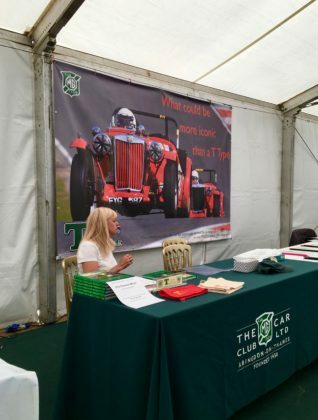 Although we didn’t hold our T Party here this year as it was so close to MG Live, nevertheless the organisers gave us club parking space (and entry discount!) 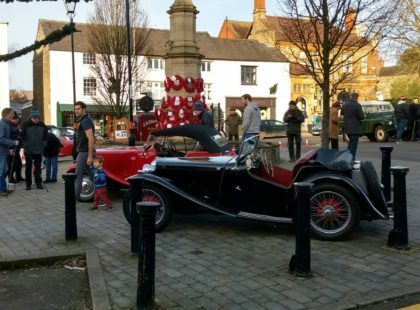 for those intrepid T Type owners who wished to attend. And we had reasonable number considering. The weather held fair, not too hot as in the previous week and the Bicester Heritage venue is pretty good. 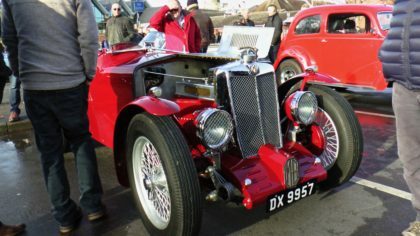 Everything is compact, there’s lots to see with a great selection of historic racing cars and sports saloons really going for it round the demonstration track. One was a 1980s monoposto car built on a KN chassis and engine, complete with supercharger. The demonstration track is a delight, with only straw bales between you and the cars so you can get up really close and smell the Castrol R … A favourite was the demonstration stationary aircraft Rolls Royce Merlin and Bristol Hercules rotary engines which when started up together made an impressive site – and noise! All the pictures of the T Types there are on our Facebook Page. It was the first time we have entered a team for this event for a number of years so congratulations and many thanks are due to Paul Critchley, Brian Goodban and Richard Hirst. 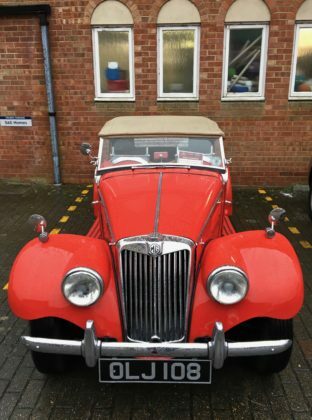 We’re awaiting photos of the team, so this news item will be added to shortly. 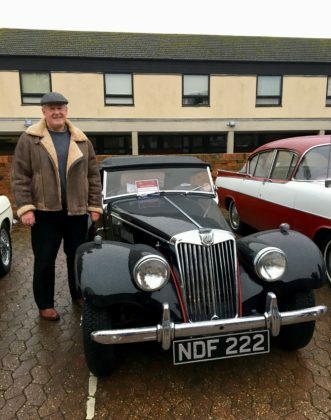 In the Iconic 50s racing series, Scott Quattlebaum brought in his MG LECo 2 XPAG Special to a very creditable 4th and mention must go to all the other T Type and XPAG Specials racers who contributed both to the race grid and to the XPAG Specials display near the main club marquee. We have a full report on the racing together with lots of photos courtesy of Colin Murrell. 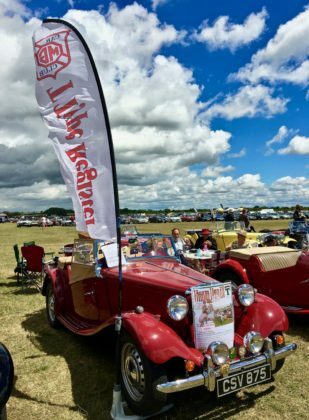 You can see pictures on our Facebook page of the T Register parking and views of the massive number of MGs that attend MG Live at Silverstone every year; and there is a report on the racing with photographs provided by Colin Murrell. And note the sunshine. And it was hot! 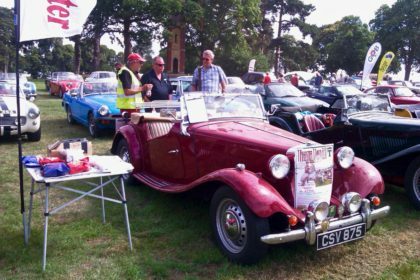 A full report of this event has been published in the T Register News for July 2017 on page 5. Abingdon, something we have not dealt with at previous Rebuilds and they were met with much appreciation. 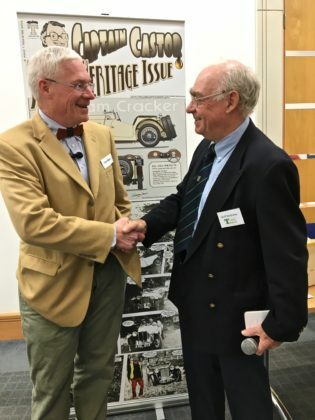 Eric Worpe gave one of his thoughtful and learned expositions on the cooling systems of XPAG engines, and Geoff Thompson of Motor-Build gave a presentation on the correct order to trim your T Type. 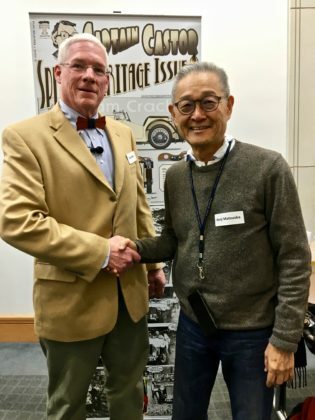 We were also honoured at the the attendance of Kenji Matsuoka, the Chairman of Kobe MG Car Club in Japan. So what with Tom and Kenji, we had a meeting of East and West on the Greenwich meridian! The pictures show (top to bottom) Geoff Matthews our Chairman greeting Tom Wilson; Eric Worpe giving his presentation; Tom Wilson and Kenji Matsuoka together. 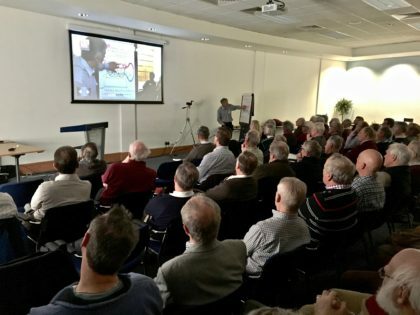 There is an en extended album of photos on the T Register’s Facebook Page showing the attendees, the presentations, and perhaps most importantly, the social side of acquaintances discussing their shared passion that is T Types. 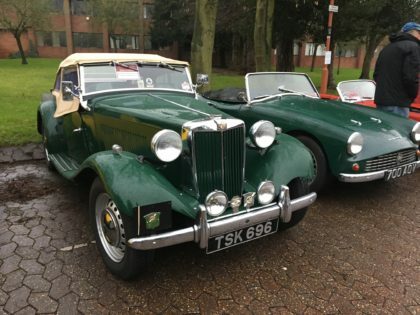 There were quite a lot of T Types there, notably on the Octagon Car Club stand where you take your pick form the unique MGA Twin Cam engined TF and the immaculate supercharged green TD which is often seen in the south midlands area. 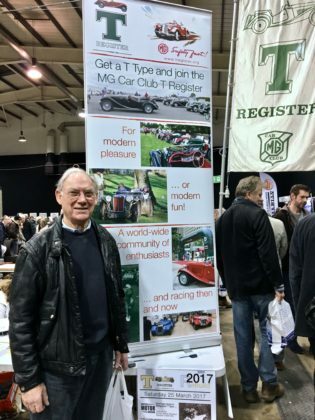 The pictures show Mike Lugg our president at the T Register stand (top left); the TD for sale on Brown & Gammons’ stand (above left); and Roger Muir’s TA outside and in front of the Halls, which I unforgiveably and mistakenly originally described as a TC (on right). There is an album of photos from the show on our Facebook Page, and a video of the event which can be found on our Facebook Page and on on the T Register’s YouTube Channel. Pictures of T Types seen at a number of Christmas and New Year 2016-2017 meetings braving the cold and working off excesses. Unbelievably wet and discouraging for most people to stay long, but there were a lot of cars there though. Bright and sunny with plenty of Boxing Day viewers getting the fresh after Christmas excesses. An L1 Magna with a Q Type body. Sadly with no supercharger under the front apron. This picture was posted by Di Russell on the T Register’s Facebook Page showing her TC.